CRYENGINE Discord server is now an official outlet for all those awesome CryDevs, old and new, to discuss and share their tips, tricks and show off their creations while gaining valuable feedback from the community and Crytek staff. Here at CRYENGINE we’re always trying to push the boundaries of community interaction towards a more open, responsive and fulfilling experience. Noticing how Discord is becoming more accessible and gaining popularity among the masses, it seemed like the perfect time to incorporate this service into our community in an official capacity. Is this a new Discord server created by Crytek? In fact no, this server was originally an unofficial community server run by our now resident and talented Roman Perezogin aka Journey – Developer of Darkness Anomaly. Roman did a great job maintaining this server and in turn attracting the attention of many developers, even our own staff started hanging out there. Roman joined us recently as part of the CRYENGINE Quality Assurance team, so we did the math and mutually decided to make the server official. So what’s new with the Discord server? While making the server official, we have reorganised the structure to make it easier to find the right channels, as well as adding some channels that were requested and we feel are appropriate. We also added Prophet – the official CRYENGINE Discord bot with some preliminary features requested by you. Who or what is Prophet? Prophet is the official CRYENGINE Discord bot. By adding an official bot to the CRYENGINE Discord server we allow the development of custom features to help you. 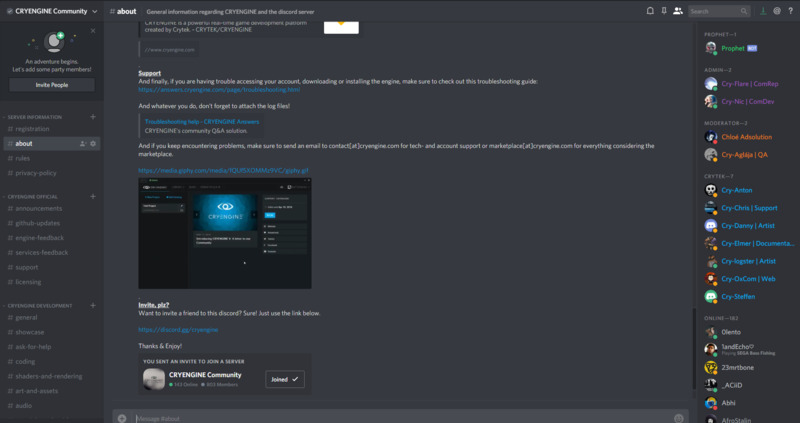 While the bot is still technically in a Beta stage, our goal is to take feedback from you and develop some more features that will help improve your experience in CRYENGINE and the Discord server itself. You can say hi to Prophet and read all about his features – a keyword search function and a reporting tool for now – in the #about channel of the CRYENGINE Discord server. We will update it when we add more features to your friendly neighborhood super nano soldier. What’s different about the official server vs. other unofficial servers? The key difference here is that you can be sure the server will be moderated by our own CRYENGINE community team and be occupied by not only talented and dedicated CryDevs and indie developers but also home to our own Crytek developers working on the engine and related services. We will continue to host Community AMAs on this server, like we did before. The next one will most likely be in January in preparation of Global Game Jam, as we needed some time to iron things out with the transition. But luckily, most of that is done now and was mostly us working behind the scenes to get everything on track; so if you are a resident of the server already, you shouldn’t have noticed anything before the changes were implemented. It also keeps the spam bots out and makes sure everyone agrees to the rules. If you are new to the server/just joined then you will see only four channels. You need to read our privacy-policy and rules, then register in the registration channel by type the command ‘!register’ to acknowledge them. Once you register you will have full access to the server and can interact in the community channels. What’s the link, how do I join this server? Everyone can invite, with this link, so tell your friends! The more, the merrier. This Server as much as any other outlet for the CRYENGINE community would be nothing without your active support and participation, so rest assured, we’re focused on delivering the best experience for you. Helping each other out, seeing your fantastic creations come to life and being able to stay in touch with our users is very important to everyone at Crytek, so we are looking forward to seeing you there! As ever, we look forward to you feedback in the comments, via Facebook and Twitter, and you can join the community and our CRYENGINE development team over on our official Discord server. Awesome news indeed. Also there is a total of 20+ developers from Crytek who hangs out there on a daily basis. Great way to get in contact with them or community members.